This tutorial will walk you through the creation of a sample application that contains RadLayoutControl. The figures in the RadLayoutControl help documentation are showing the control with the Windows8 theme applied. You can see how to set a theme in the Setting a Theme help article. You can find a list with the required assemblies for each control from the UI for WPF suite in the Controls Dependencies help article. 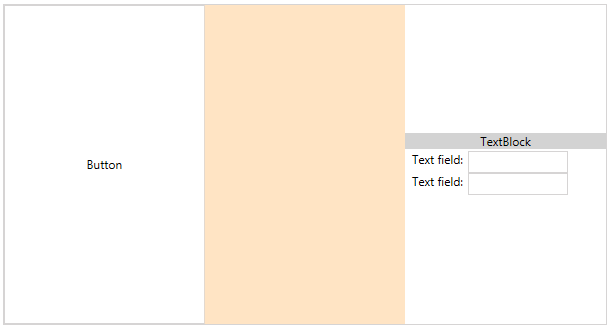 You can add RadLayoutControl manually in XAML as demonstrated in Example 1. RadLayoutControl doesn't display any content when it is not populated with items or layout groups, so at this point only the border of the control should be displayed on the screen. You can add items through the Items collection of RadLayoutControl. 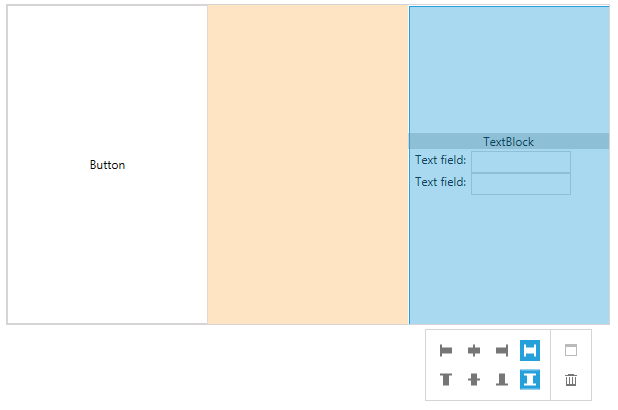 The layout component works with LayoutControlGroup controls and UIElements. In other words you can populate it with all visual elements provided by the framework. Example 2 demonstrates this. Example 2: Adding items in the RadLayoutControl. By default the layout control and its groups are ordering their items with horizontal orientation. You can see how to change this in the Orientation help article. You can nest LayoutControlGroups into one another which allows you to separate the layout into different groups that can be arranged along with their items. RadLayoutControl doesn't support data binding and setting its ItemsSource property will throw an exception (NotSupportedException). 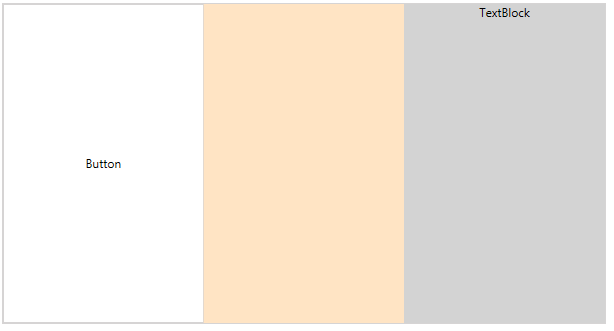 There are few layout group controls which can be used with RadLayoutControl. Each group has different appearance. You can read more about this in the Layout Groups section in the documentation. Additionally, the Code Example section of this help article demonstrates the different layout groups. The control allows you to rearrange its children at runtime. To enable this the IsInEditMode property of the control should be set to True. Figure 4: The layout setup from Example 3 with one of the groups selected. Read more about the edit mode in the Edit the Layout article. 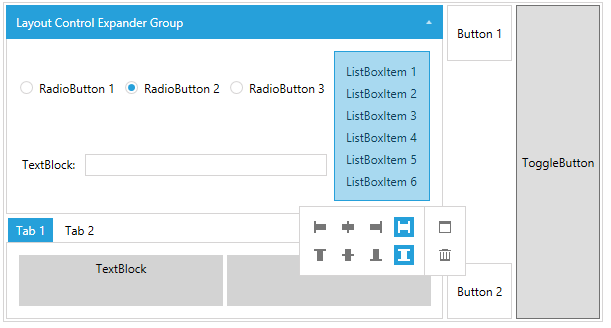 This section demonstrates a basic layout set up with nested groups and different group types. You can switch between normal and edit mode of the control by setting its IsInEditMode property.